who proceeded to grow rapidly as we kept him. 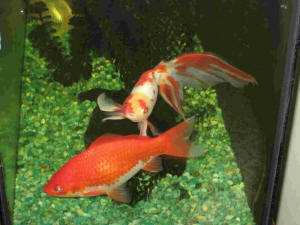 We were not surprised, we have a large tank and so tend to grow large fish. WE never saw any cause for concern about him, he has always been healthy and happy. About a month ago, he started expanding prodigiously in the lower half of his body, and now has tripled his size and is growing fluid filled blisters on his sides and underbelly. as he is retaining all of his scales, which are spreading out but staying flat, except where pushed out by a blister. Apart from some trouble navigating these do not seem to trouble him, and he has been eating and breathing normally. We do a 60-70% change weekly, being careful to maintain water temperature. We don't have much hope of saving him, but do you have any idea what's causing this? Hello and thanks for the great resource! 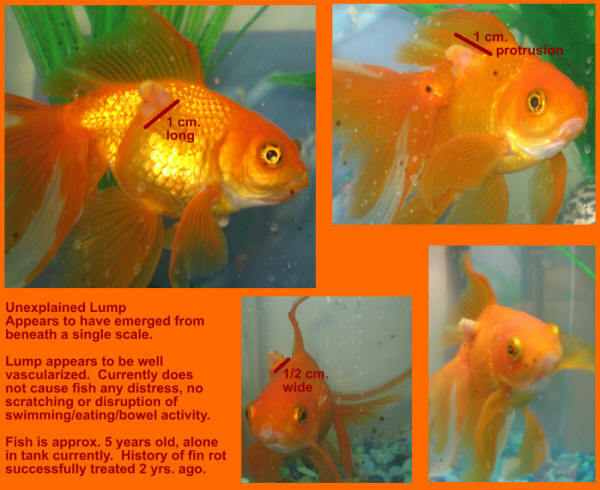 We have a 5 year old goldfish that we bought for our son when he was a young boy. I'm sure this is a very common scenario, but we didn't do much homework before making the purchase. The fish is in a 10-gallon tank, which I now know (thanks to your great website) is quite undersized. Also, we have not maintained a frequent enough schedule of water changes, as the latest dipstick tests revealed Nitrates at 200, no Nitrites, a hardness between 150-300, low alkalinity and a pH of 6.2. I plan upon changing out some water immediately, and then maintaining a more frequent schedule with a goal of keeping the nitrate level as low as possible, and perhaps raising the pH into the 7 range somewhere. Our fish had fin rot pretty badly at one point a couple of years ago, but we treated him and the water and he has bounced back nicely. Sadly, he has now developed a lump on one side that appeared to emerge from beneath a single scale, but has since grown to protrude about 1 cm from his body, and is about 1cm long by 1/2 cm wide. Studying the WWM website for the past few days leads me to believe that this is a tumor, but I have attached an image that you can use to add your opinion to this diagnosis. The lump appears well vascularized, and causes the fish no visible distress (no scratching, swimming disruption nor eating/bowel changes). I am hoping that the increased water quality will help the fish to fight the tumor, but it sounds like there is little to be done in the way of treatment otherwise. Please have a look and let me know what you think about our lumpy friend. Thanks again for your time and for sharing your expertise with us! Hello WWM, thanks for taking the time to read this! 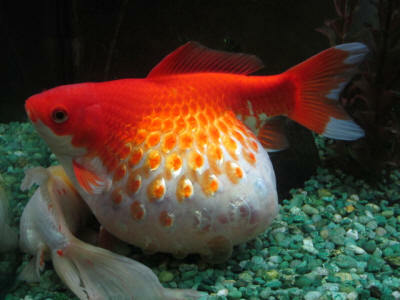 I have a 12 inch common goldfish that I have had for about 8 years. About 4 years ago it developed a black spot on it's side. I treated it for black spot disease and it went away. However, about a year ago in the same spot a tumor or ulcer like bump grew from the same spot. It didn't seem to affect it's health at all, so I thought it would just go away. Recently it has been growing and is now about the diameter of a dime. Any clue on what it may be or how to cure it? My name is Kelly and I have to goldfish, the Oranda and a black moor. I got both at the same time about 6 months ago and they have been just wonderful. They are on a diet of Tetra Fin goldfish flakes one day and 5 green English peas the next for their constipation issues and general good diet, I've noticed from their feces that they also snack on the green algae in their tank some. and I have a water conditioner by API called stress coat that I squirt a few drops of into the water maybe once a month. The tank has a 5-10 gallon aqua tech filter on it and I change the filter once a month. Their water temp stays at 73 which I know is a little warm but I can't blast my ac any higher to keep them cooler. They have a little log and a conservative amount of plants to hang around so they still have room to swim about. I also have a nice bubble strip in the tank for plenty of oxygen. 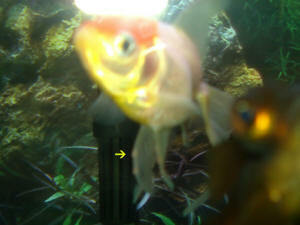 Now to the issue, today I noticed three-four small red swollen spots along the edges of each of my Oranda's fins. He is still very active (much more so than my black moor who sleeps a lot and has always done so (and no the Oranda is not aggressive towards him) and he is eating fine. I can not find this anywhere and have not seen any images of it and I have searched everything! I am trying to catch this, if it is a problem, before it progresses any further. I have spent a lot of money on these fish because when I first got them I did not realize how needy they were but I want to care for them properly so I upgraded their tank, bought water conditioner, better decorations (for hiding and reduced stress level, also silk plants to keep their fins and eyes safe), and change the filters more often, etc. I don't want him to get sick now! He is so pretty. Please help! I have been adding tap water that is dechlorinated with tap water conditioner (it says it removes chlorine and chloramines) and have changed nothing else. I feed them once a day so I don't think over feeding is a problem, they always eat all of the food either at the top or as it floats to the bottom if the filter doesn't catch it. I got the one I have from a friend for much less than it would have been in the store, I originally had them in a 5 gallon! I am on a college budget and was uninformed when I got these fish but I have spent a lot trying to take the best care of them I can. I know the 10 gallon really isn't adequate but its the best I can do for now, I do water changes often though and the water is never cloudy and the bottom stays clean. How long will it take for him to start healing and should I do more for him now that the small red spot has appeared on his belly?